The combination of a nutritious diet and the right dietary supplements can help to give your skin a radiant, healthy and more youthful glow. Vitamins, minerals, antioxidants and phytochemicals obtained from good food and high quality supplements play an integral role in skin health and make an important difference in the overall look and feel of your skin. Many of us may slather our skin with expensive lotions and potions in pursuit of healthy looking skin without thinking about nutrition. While there are many very good personal skin care products for external application, it’s important to nourish your skin from the inside out if you really want to have the healthiest skin possible. To put your best face forward, fill your shopping cart with powerhouse foods that provide the nutrients your skin needs to fight age-related damage and look its best at every age. For the healthiest skin, a combination of strategies, including diet, supplements, moisturizers, sunscreens, and healthy lifestyle habits, is necessary. Excessive sunlight exposure, smoking and environmental pollutants all contribute to photodamage, wrinkles and poor skin texture. Concentration on a healthy diet that includes a variety of antioxidant rich foods can provide valuable skin protection, as research shows antioxidant vitamins help support collagen and elastin and protect against DNA and sun damage. Conversely, limiting unhealthy processed foods and oils helps to reduce the negative effects of aging that contribute to unhealthy looking skin. A well rounded diet of healthy fats, sufficient protein and lots of nutrient rich fruit and vegetables is a recipe for a beautiful complexion. Truth holds that we are what we eat, as studies have shown that people with poor diets, high in sugar and refined ingredients, are likely to have more wrinkles, less elasticity and more collagen loss. Diets rich in the nutrients that hinder inflammation help keep skin supple, provide natural sun protection and increase skin elasticity. Chronic skin conditions, such as acne or premature aging, are linked to chronic inflammation. Reducing inflammation by boosting immune function through good nutrition, detoxification and hormonal balance can significantly soothe and improve the skin. Some might say that skin is a great communicator, as skin is often the first area where visible signs of aging are noticed. It pays to look inward to understand what’s going on with your health, as eventually health problems will show up on the skin. Apparently, beauty is not just skin deep, as skin health is linked to major functions of the immune, respiratory, circulatory and lymphatic systems. Paying attention to the health of your skin is one of the easiest ways to see how well your body is functioning. To ensure optimal skin and support overall health, make sure to feed your body the nutrition it requires and deserves including vitamins C, E, A, K and B complex, minerals such as zinc and selenium and omega-3 essential fatty acids. Moisturizers, such as those that contain antioxidant vitamins C and E, are great for overly dry or itchy skin. Topical applications of micronutrients in addition to dietary consumption can help feed the skin and maintain and strengthen the skin’s protective barrier. Be sure to hydrate your body and your skin daily by drinking enough water to satisfy your thirst. Drinking a glass of water with each meal, one between meals and one before and after exercise is a good rule of thumb for sufficient hydration. While gravity and genetics may play a role, to maintain healthy skin as you age pay close attention to what you feed it. A balanced diet augmented with nutritional supplements and a healthy lifestyle may just be the best approach for overall health and lovely skin. 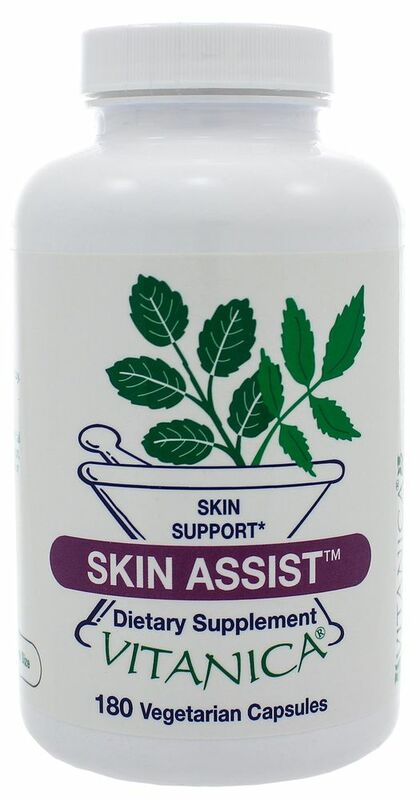 Skin Assist™ by Vitanica – This product promotes healthy skin with supportive antioxidant nutrients along with B vitamins, minerals and herbs. These ingredients support physiological functions of the skin and balanced hormonal effect on the sebaceous glands in support of blemish-free skin. Wheat, dairy and sugar free vegetarian formula. MSM powder by Pure Encapsulations – This highly recommended product provides 34% bioavailable elemental sulfur necessary for maintaining connective tissue health, particularly collagen and keratin. MSM has anti-inflammatory and detoxifying properties that help to benefit and strengthen the skin’s support matrix. BioSil® Skin, Hair, Nails by Natural Factors – BioSil® helps to increase skin elasticity by providing natural and safe ingredients that support the body’s own natural collagen production. Gluten, soy and dairy free formula. Ultra HNS (201345) by Douglas Laboratories – This product is designed to support healthy skin aging as well as improve the strength and appearance of the skin, hair and nails. Ultra HNS provides high dose biotin, zinc and vitamin C along with patented, solubilized keratin for skin structural support. Nutrients for Healthy Skin: Inside and Out. If the old adage “you are what you eat” holds true, then the path to beautiful skin may be through your stomach. For truly fabulous, glowing skin, consider your dietary choices. The more balanced and healthy your diet, the better your skin health will be. While we may pay some attention to our skin, by cleansing, moisturizing or applying sunscreen, a healthy diet and lifestyle are also essential to skin health. When we deprive our skin of critical nutrients, we may develop skin that looks sallow, dry and older than our actual age, revealing a lot about our overall health. Our skin is in a constant state of renewal, as old cells are shed and new cells take their place. As our largest and most complex metabolically active organ, our skin regulates body temperature, manufactures vitamin D, provides protection from the elements and defends against harmful, invading bacteria. Our skin plays a huge role in protecting our body, so keeping our skin as healthy as possible is a wise choice. While often overlooked, to put our best face forward we must give our skin some attention every day. Nutrients – The less attention we pay to our diets, the more problems we may see with skin health. Fresh foods, especially fruits, vegetables and dairy products, provide a balanced mix of vitamins, minerals, phytonutrients and antioxidants to help keep skin vibrant. Dairy products, such as plain yogurt, provide the vitamin A necessary for good skin health. Probiotics found in yogurt and other foods have a beneficial impact on the skin. Probiotics help keep chronic inflammation at bay and support the beneficial gut bacteria, which in turn strengthens immune function and supports overall health. Antioxidants, such as those found in berries, provide free radical defense and guard against premature aging. Omega-3 essential fatty acids, such as found in cold water fish and flax seeds, support healthy cell membranes, reduce inflammation and aid moisture retention for plumper skin cells. Purple fruits and vegetables are rich in anthocyanins, which are antioxidants that help improve circulation. Improved circulation means that more oxygen and nutrients reach the skin, enabling the formation of new cells, collagen and elastin. Spicing up your meals with herbs such as ginger and cinnamon, which have anti-inflammatory properties, can help reduce facial puffiness. Eliminate sugars that can cause inflammation and lead to glycation, which contributes to the breakdown of collagen and elastin and prematurely ages the skin. Cleanse – Different skin types may require unique cleansers but be sure to choose cleansers without fragrances and dyes, which can irritate sensitive skin. Mild cleansers that won’t strip all the natural oils from your skin are a good choice. Use warm, not hot water, which can strip the natural oils and lead to itching and dryness. Be sure to wash your hands before you wash your face. Most of the bacteria that can cause breakouts come from our own hands. Moisturize – Look for skincare products that contain botanicals such as beta carotene, which can improve skin quality. Moisturizers that contain B vitamins, especially biotin, aid in hydration and help perfect overall skin tone. Vitamin B3 (niacinamide) helps to strengthen the moisture barrier and reduce redness. When applied topically, vitamin K helps to reduce dark, under eye circles. Apply moisturizers while the skin is still damp to help retain surface moisture. Hydrate – Water is essential to skin health. Hydrate your skin from the inside out with enough water to quench your thirst daily. In addition to hydrating, water aids the cells in nutrient absorption and helps move toxins out. Plus, when our bodies are hydrated, we sweat more efficiently, which helps to keep skin clean and clear. Avoid stress – Skin under duress can quickly become irritated and red. While chronic stress can wreak havoc in the body, it shows on the outside too. Take steps to find some quiet time each day to minimize stress. Exercise – Regular exercise not only helps to cleanse pores and flush out toxins, it can stimulate collagen production and reduce signs of aging. Exercise is stress reducing and pumps increased oxygen and nutrient supplies throughout the blood stream, aiding in skin nourishment. Sunscreen – Sun damage can happen year round, so choose an SPF-30 for daily use. Sunscreen not only protects against sun damage and skin cancer, it can help prevent fine lines, wrinkles and uneven skin tone. Smoking – Smoking causes premature aging of the skin and reduces the skin’s natural elasticity. Smoking is believed to cause collagen breakdown and reduce collagen production, leading to early wrinkling and for some a leathery complexion. While a well balanced diet is extremely important, to get the nutrients we need each day include a multivitamin along with your skin care regimen. Antioxidants such as vitamins C and E help fight free radical damage, aiding in wrinkle protection and helping to prevent premature aging. Vitamin C is essential to collagen production and aids in skin cell repair. Vitamin E helps to protect skin cells from UV light damage. Protect those cheek bones with calcium. Calcium supports bones and bone structure in the face as well as the body. Zinc helps to keep skin clear and binds with vitamin A, which makes both nutrients more effective in keeping skin healthy. Essential fatty acids or omega-3’s are instrumental in the production of the skin’s natural oil barrier. If your skin is dry and prone to inflammation, essential fatty acids can aid in keeping your skin smoother and younger looking. MSM Capsules by Pure Encapsulations – This patented product promotes healthy joint function and connective tissue health, especially tissues containing significant amounts of collagen and keratin such as skin, hair and nails. Also available in powder form. Complete Care For Youthful Skin Kit by Suki – This complete skin care kit provides a protective, proactive program that contains powerful antioxidants, collagen building peptides and vitamins to address fine lines, wrinkles, uneven skin tone and visible signs of aging. Deeper Greens Powder by Ortho Molecular – The fruits and vegetables contained in this product provide a good source of dietary fiber and natural concentrates of high ORAC value foods. Deeper Greens is formulated to fulfill the recommended dietary intake of 5 daily servings of fruits and vegetables. Organically grown fruits and vegetables used where available. Pure Emu Oil with Vitamin E by Age Advantage Laboratories – This very pure quality Emu oil has been effectively used for years for healing and moisturizing the skin. The non-comedogenic oils provide a very high natural balance of essential fatty acids along with vitamin E for anti-oxidant protection and palmitric acid to stimulate new skin cell growth. Vitamins, minerals, and other nutrients have the power to give skin a more radiant, healthy, and youthful appearance. Feeding your skin from the inside to meet its nutritional needs can make a difference in how your skin looks and feels. Health experts agree that vitamins and minerals play an essential role in a healthy complexion whether in the form of food, supplements, or beauty products. A balanced diet will improve skin health just as it improves overall health. The more healthy foods you consume, the better your skin will look. The reverse is true as well. When we don’t pay attention to a healthful diet and we starve our skin of nutrients, skin problems in the form of breakouts, chronic skin conditions, or signs of aging may result . When combined with a good diet, the right dietary supplements can keep your skin looking younger and healthier. The American Academy of Dermatology (AAD) suggests the following vitamins, minerals, and antioxidants that support and nourish skin health, whether taken in supplement form, applied directly to the skin, or obtained from the foods we eat. Vitamin A – Vitamin A is necessary for skin maintenance, including cell building and repair. Vitamin A is a nutrient proven to revitalize skin by increasing cell turnover, a biological process that replaces older skin cells. Considered one of the best vitamins for promoting healthy skin, vitamin A may help reduce signs of aging while preventing dry skin and acne. Vitamin A can be found in foods such as dairy products, eggs, leafy greens, and sweet potatoes, and in many skin lotions and creams as well. B Complex – Redness, irritation, dermatitis and pigmentation can all be signs of vitamin B deficiency. B vitamins are essential for healthy skin, hair and nails. Vitamin B12 aids in cell reproduction and skin renewal. B1 boosts circulation, which helps to give skin a healthy glow. Vitamin B3 boosts hydration, reduces redness, aids in supplying oxygen to the skin, and helps in preventing and improving acne, eczema, and sun damaged, aging skin. B vitamins can be found in shellfish, beef, cheese and eggs. Vitamin C – Considered an all-around anti-ager, vitamin C plays a vital role in maintaining the health of your skin. Vitamin C is key to the production of collagen, a protein that aids in the growth of cells and blood vessels and gives skin its firmness and strength. As an antioxidant, vitamin C aids in neutralizing free radicals, promotes skin repair and may help reduce damage from sun exposure. Citrus fruits, peppers and tomatoes are good sources of vitamin C. Vitamin C can also be found in many topical skin care products. Vitamin E – Vitamin E helps to keep skin smooth and may help prevent premature aging by reducing fine lines and wrinkles. This powerful antioxidant aids in skin tissue repair and helps to neutralize the damaging effects of free radicals from too much sun exposure. Vitamin E helps the skin retain its natural moisturizers, quelling dryness and keeping skin supple and healthy. Foods containing vitamin E include tofu, spinach, avocados and nuts. Probiotics – Widely known for their beneficial role in gut health, probiotics help maintain a healthy digestive system, which is critical for nutrient absorption. As more nutrients are digested and absorbed, your skin receives more vitamins, minerals and antioxidants that aid in the elimination of free radicals and toxins, which can damage and age skin. Research indicates that poor intestinal health can exacerbate skin conditions such as eczema, psoriasis and acne. Omega- 3’s – Essential fatty acids are responsible for the cell membranes that act as barriers for harmful pathogens and as the passageway for nutrients and wastes. Cell membranes hold in water, which helps to keep skin plump and moist. Omega-3’s offer protection from inflammation, which can harm skin cells. The foods highest in omega-3 fatty acids include cold water fish, walnuts, canola oil, and flax seed. Water – A very basic part of any healthy diet, water is essential for skin health and beauty. Water flushes away toxins, brings nutrients to the cells and supports organ functioning. Well-hydrated cells are plump, which helps your skin look firmer and smoother. OmegaGenics EPA-DHA 720 by Metagenics – This product features a highly concentrated source of health-promoting omega-3 essential fatty acids from cold-water fish. Each softgel provides a total of 720 mg of EPA and DHA. PureProbiotic (Allergen Free) by Pure Encapsulations – Each capsule of PureProbiotic provides 5 billion CFU of Lactobacillus acidophilus, Lactobacillus plantarum, Lactobacillus rhamnosus, Bifidobacterium bifidum, Bifidobacterium lactis and Bifidobacterium breve. Vitamin A 25,000 IU (A97) by Thorne Research – High potency vitamin A for maintaining healthy skin and immune system.